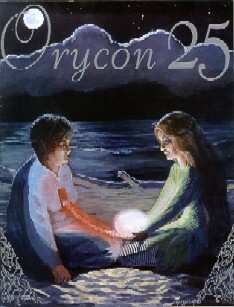 This story was written for the OryCon 25 program book, and it’s a celebration of twenty-five years of OryCon. But, fannish though it is, it’s also intended as a real science fiction story; the fannish and specifically OryCon-ish references only add to the experience. You should be able to enjoy it even if you’ve never been to a convention. This is a story about love and loss, about the weight of years, about creativity and nostalgia, about organizational and interpersonal politics. The characters are all based on fans I have known, though no character is based entirely on any one person. In some ways the gravity hackers in the story are more like costumers, or art car people, than they are like science fiction convention-running fans, and their history and relationships have been made more intense for story purposes. Thanks to John Bunnell for commissioning it, Keith Brooke for agreeing that it deserved a wider audience, and Sara Mueller for rescuing Babette from stereotype. I was at the bar, in a crowd of old-timers catching up with Gary (but carefully avoiding the tender spots in our shared history), when Striker called out the news of Mira’s approach. Immediately we floated up to the bar’s big viewing window, a jostling flock of graying, overweight gravity hackers bumping lightly against each other like a school of tuna. Connie, a New Yorker whose ship looked like the Chrysler Building as a baby, had an image amplifier in her thigh pocket, and it got passed around in a flurry of impatient demands and gawps of wonder. Finally I snatched it from someone’s hand and peered through the eyepiece at Mira’s rising ship. It was done up as a submarine. Not just any submarine, either — Jules Verne’s Nautilus, a Victorian confection of brightly polished copper and brass, sparkling with glass and bristling with filigree and gingerbread. Soft blue and green light rippled from its portholes, adding to the underwater effect. As the ship approached, details became apparent: spiraling sea shells and sensuous mermaids encrusted its hull, and for a figurehead it sported a huge brass narwhal, its unicorn tusk thrusting forward through the vacuum. “She’s still got it,” I said, and offered Gary the image amplifier. He waved it away. “Mira always said her work is best appreciated with the naked eye.” The expression on his face was subtle as a fine wine — sorrow and regret and anger mixed together, filtered through the mind of an engineer, and aged for ten years. Gary and I floated side by side watching the sub grow from a fingerling to a whale. It was easily twice the size of any other ship in the parking lot, and the waves of light from its portholes made that collection of flying teddy bears, Christmas trees, and DeSotos look as though they too were under water. The force of Mira’s personality transformed those other ships into mere setting for her latest creation. Finally, majestically, the sub drew to a halt, and there was a scattering of applause. But Gary and I exchanged a knowing glance. A moment later, the crowd gasped as an enormous chartreuse tentacle came curling up from behind the sub, followed by another, and then another, and then the saucer-eyed head of a giant squid rose into view. The squid wobbled a bit as it inflated, but the illusion was otherwise nearly perfect, and the crowd applauded with greater and greater enthusiasm as the tableau stabilized. Fully inflated, the squid was even bigger than the sub itself; its eyes leered with menace as its tentacles held the sub in a death grip. Gary applauded as hard as anyone. But his eyes shone with tears. We moved into the airlock lobby as the applause dissolved into a babble of discussion and speculation. Was that real brass plating over the structural foam, or just paint? Were the squid’s seven tentacles an error, or a reference to a movie from the last century? And who was her co-pilot du jour? Gary floated in the middle of it, saying nothing, his expression neutral. Connie came up to him and seemed about to speak, but her unspoken question collided with the look in his eye and she just shook her head and turned away. Then came the whir of the inner door, and Mira floated into the lobby to thunderous applause. Her suit was done up as a diving suit, of course; a fantasia of a suit with a brass airpack as rococo as the ship. She undogged the helmet, red hair spilling into the air, and smiled her appreciation at the crowd, acknowledging old friends with blown kisses. And then she turned and gestured into the airlock. Above the waist Babette’s suit was close-fit, painted to match her own pale skin except for the twin scallop shells over her breasts; the helmet was a transparent bubble that almost wasn’t there. Below the waist she wore a fish’s tail, encasing both legs and shining with metallic scales in iridescent green. It wasn’t much of a handicap in free fall. I’ve never understood where Mira keeps finding such gorgeous girlfriends. This one was a blonde, slim and willowy as Mira always preferred, with large expressive eyes and perfect high cheekbones. She looked to be about twenty-five. Mira herself, as even she would admit, was no beauty, having a long face and a substantial nose. She was fifty-one, the same age as me and a year younger than Gary. But she was a genius with clothing and make-up, her blue eyes crackled with intelligence, and her petite body hummed with creative energy. The substantial inheritance that supported her gravitics hobby didn’t reduce her allure, either. But she was a woman of powerful opinions and her temper was legendary. Perhaps that was why her girlfriends rarely lasted a year. Most of the crowd focused on Babette, who swam through the air with a lithe unconscious grace as she unscrewed her helmet, but Gary ignored her; his eyes were locked on Mira as though she were a closing door between him and Paradise. Mira, in turn, divided her attention between admiring Babette and enjoying the crowd admiring Babette. She contained herself well when she noticed Gary, I’ll grant her that; she only nodded to him as she had to so many other old friends. But her eyes kept creeping back to him, then flicking away as she noticed he was still watching her.